Your rebate has been approved as of 1/30/2013. It takes 8-10 weeks from the date of approval for the rebate payment to be issued and sent out. Additional assistance please contact customer service number 1-877-552-3988.Please have tracking number readily available before contacting an agent. As always for all rebates, ensure you have copies and ensure you filed based on directions provided. I normally don’t have a problem with 4myrebate.com, but it just this time, it just annoyed me and I’m not sure if they’re going to look into my email complain send to them just now. Our decision to not approve your rebate claim was based upon examination of the documents that we received from you. However, the rebates sponsoring manufacture/reseller has authorized us to offer you one additional opportunity to resubmit for this rebate claim. unfortunately you are not eligible to resubmitt. 1 – Kindly click on to resubmit. 2 – Once you complete Step #1, simply reprint and sign your rebate application from the Rebate Status page by clicking on the link that reads “Print Your Rebate”. 3 – Include any missing documentation and/or information that we have listed above as the reason(s) for your claim being denied. 4 – Send your printed rebate along with all required documentation to the PO Box address indicated on the rebate application. For your convenience the rebate application contains a mailing label with the preprinted address. 5 – In order for your claim to be re-considered, you must to resubmit within 30 days from the date that your original rebate application was declined. 6 – For all customer service inquiries, please call:877-552-3988 Mon. – Fri. 9-6 pm (EST) or send an email to: msi@help.4myrebate.com. 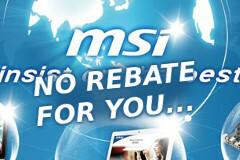 Thank you for using msi.4myrebate.com!